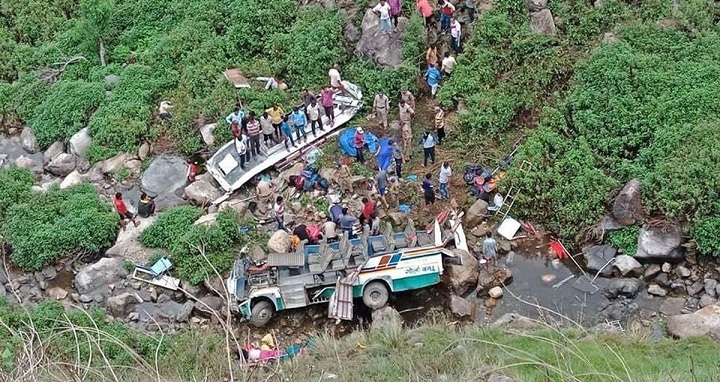 Dhaka, 1 July, Abnews: Forty-five persons have died while many others were injured after a bus they were travelling in plunged into a 60-metre gorge in the Dhumakot area of Uttarakhand's Pauri Garhwal district. According to TV reports, 20 bodies have been recovered so far. State Disaster Response Force IG Sanjay Gunjail has confirmed 45 casualties. According to the police, the accident took place at about 9am, near the Queens Bridge on the Pipli-Bhaun Road when the driver lost control of the 28-seater bus which was headed to Ramnagar from Bhaun. Those injured have been referred to the hospital. Earlier ANI had quoted Garhwal commissioner Dilip Jawalkar as saying the number of casualties was expected to rise.